Given that the United States once set global precedents for environmental protection and physical planning, it is hard to grasp just how far we have fallen. The U.S. Supreme Court, though, has now made the reversal clear. In a “A Legal Blow to Sustainable Development,” the New York Times details the impact of the latest blockbuster court decision on planning. In simple terms, the Koontz vs St. Johns Water Management District case involved a development permit decision. The developer, Koontz, applied for a permit to build a small shopping center, and his plan included filling three acres of wetlands. In a common negotiation practice, the water management district suggested changes to Koontz’s plan that would make it more likely that his permit would be approved. Koontz could either reduce the size of his development, or he could pay a fee for wetland restoration elsewhere and proceed to fill the wetlands on his own property. Koontz refused to negotiate, and the water management district denied his permit. Koontz sued, and the case went all the way up to the Florida Supreme Court which sided with the water management district. Koontz has since died, but his case went on from Florida to the U.S. Supreme Court. Yesterday, the justices delivered a 5/4 decision to reverse the Florida Supreme Court’s decision. In this blockbuster decision, Koontz has achieved a measure of immortality. While that may sound obscure, the decision in Koontz v. St. Johns River Water Management District will result in long-lasting harm to America’s communities. That’s because the ruling creates a perverse incentive for municipal governments to reject applications from developers rather than attempt to negotiate project designs that might advance both public and private goals — and it makes it hard for communities to get property owners to pay to mitigate any environmental damage they may cause. As Justice Kagan correctly explains in her dissent, the decision will very likely encourage local government officials to avoid any discussion with developers related to permit conditions that, in the end, might have let both sides find common ground on building projects that are good for the community and environmentally sound. Rather than risk a lawsuit through an attempt at compromise, many municipalities will simply reject development applications outright — or, worse, accept development plans they shouldn’t. The Adventures of Tom Sawyer was the family read-aloud book this past spring. I found myself especially drawn to Twain’s description of the Mississippi River, a reminder of how much of an impact the Big Muddy had on my own childhood as I grew up along its banks. Naturally, I watched the new reports in May as my hometown flooded, and I wondered if the many miles of levees could possibly hold. 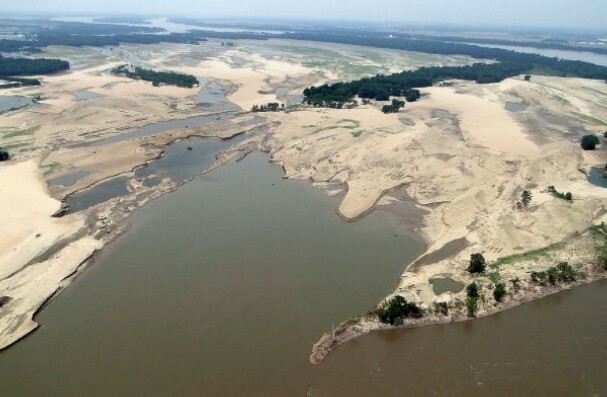 The system put in place by the U.S. Army Corps of Engineers largely did its job, but the river still exacted a price, eating away at the banks and attempting to carve new channels (i.e., doing what rivers do in flood events). A report in the Memphis Commercial Appeal details the costs of “bank failures” from the big flood. With federal budget cutting fever rampant in D.C., you have to wonder about how many federal dollars will be directed toward the repairs. Corps officials estimate it will cost $222.5 million to undo the damage inflicted by the river as it tried to create new channels during the flood. If the repairs aren’t completed before the next big flood, the Mississippi could complete the course changes it began this year. That $222.5 million sum is in addition to the projected $327.7 million it will take to fix flood-damaged levees, the $157.4 million worth of flood-related dredging needed and the estimated $70.6 million required to restore spillways and similar structures. To pay for those and other damages, the U.S. House approved $1 billion in emergency appropriations for the corps in the energy and water bill. But the Senate has yet to approve any funds. 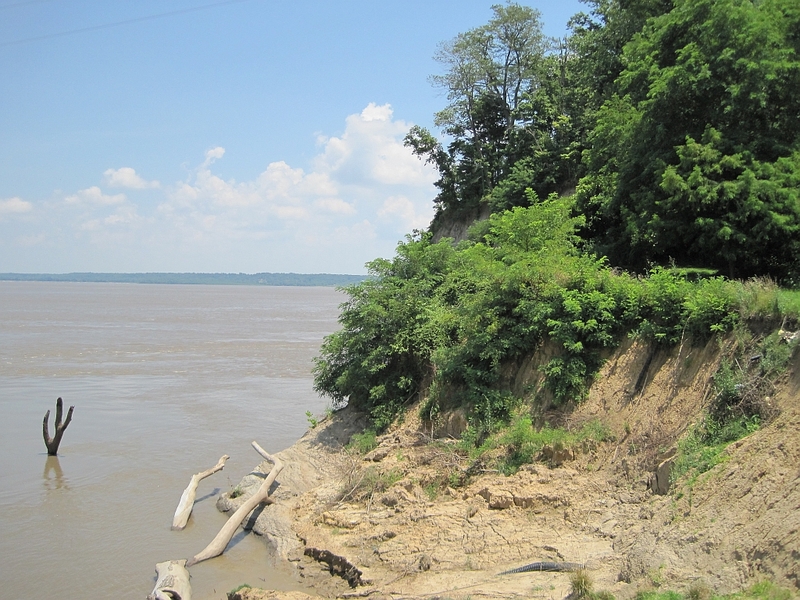 One of the bank failures, .5 mi wide and 1 mi deep into Presidents Island near Memphis. Photo by International Port of Memphis. When I was a graduate student, one of my favorite landscape planning books was Design For Human Ecosystems by John T. Lyle, and it is still a favorite. It was originally published in 1985, with a paperback edition published in 1999. A major premise of the book, and, indeed, of all landscape planning, is that careful analysis of landscape resources leads to land use planning and design solutions that achieve a balance between different, and often, competing interests. If that could just be the case more often than not! A reminder of how intractable some issues can be comes from the world of renewable energy. We have heard for some time that wind turbines kill birds, and we keep hoping that a solution may be found to this problem, like the development of slower moving turbines. A report today from Umair Irfan of ClimateWire (subscription service from E&E Publishing) tells us that the problem has not been solved. While house cats and windows kill many urban bird species, turbines pose a unique threat to many more species of birds, including whooping cranes and raptors. Less reported, though, is the significant threat to bats. With white nose syndrome devastating the hybernating bat species, it is especially distressing to hear that wind turbines are killing migratory bat species. “Many more bats than birds are killed by wind turbines, and they are killed in two ways: simply by being hit by the blades, and some are killed by pressure changes due to the sweep of the blades without even being hit,” said John Whitaker Jr., a professor of biology and director of the Center for North American Bat Research and Conservation at Indiana State University, in an email. Because bats use sound to navigate and can detect moving objects, like insects, exceptionally well, many are better able than birds to avoid striking the blades. However, they can’t detect the invisible swath of low pressure left behind turning blades. Bats then fly into this area, and their internal airways rapidly expand, causing internal bleeding. This phenomenon, known as barotrauma, accounts for more than half of all turbine-related fatalities in bats, according to a 2008 paper in the journal Current Biology. Simply mapping landscape resources and locating the best areas for wind energy generation and the most significant migration areas, ala Lyle, McHarg, and others, will not lead to a solution to this problem. From a land use planning perspective, it is an issue of conflicting values. As wind energy proliferates around the globe, we have to hope that a technological solution can be found soon. That would seem to be the shortest path to resolving the dilemma. Mora, C. and P.F. Sale. 2011. Ongoing global biodiversity loss and the need to move beyond protected areas: A review of the technical and practical shortcomings of protected areas on land and sea. Marine Ecology Progress Series 434: 251-266. During the ice age, many plant species shifted southward, and at glacial maximum around 18,000 years ago, boreal forest reached Arkansas, with spruce and tamarack in the Tunica Hills along the cold, foggy Mississippi valley. Deciduous forests of oak and hickory extended to the Gulf of Mexico. As the glaciers retreated and the climate warmed, pines and other species from refugia in Florida, along the lower Mississippi River, and southern Texas and northern Mexico, spread across the southeast. As we contemplate the opposite movement of species, the northward shift, we must begin to identify and protect places of refugium. Major land conservation organizations like The Nature Conservancy are already engaged in this sort of planning exercise as they account for climate change impacts on the lands they manage. Federal land management agencies are also considering ways to provide refuge to species, in part because of a 2009 executive order by President Obama that mandated integration of climate adaptation planning into all agency planning activities. These are positive steps, but, like all conservation activities, they need to extend beyond public lands and private conservation lands to have the greatest effect. This is where planners and designers can make a contribution – considering the potential for refugia on privately held land in communities across the country. It’s the next step in environmentally sensitive areas planning and an opportunity to “mainstream” climate adaptation into ongoing community planning and design. In its simplest form, “hot-surviving” refugia are found on the northern slopes of hills and mountains, at higher elevations, in mountain coves and hollows (known as “hollers” in another place I’ve called home), and in deep canyon recesses. The good news? These places are very easy to identify in the landscape! The next steps, a bit more difficult. In another post, I will discuss a related topic, the controversial idea of assisted migration. What do you do when historical data is no longer useful for predicting the future? Climate change is making the already-difficult proposition of predicting environmental phenomena even harder. Consider societal efforts to manage the flood system. The concept of a 100-year flood is based on the idea that history is useful indicator of future states and “most likely” scenarios. A 2010 paper by Gersonius et al. * tackles the question of how we might begin to plan for shifts in flooding regimes by using adaptive management strategies. This paper is at the leading edge of climate adaptation design research, and there is a need for much more. Gersonius et al. contrast the traditional approach with an adaptive approach. 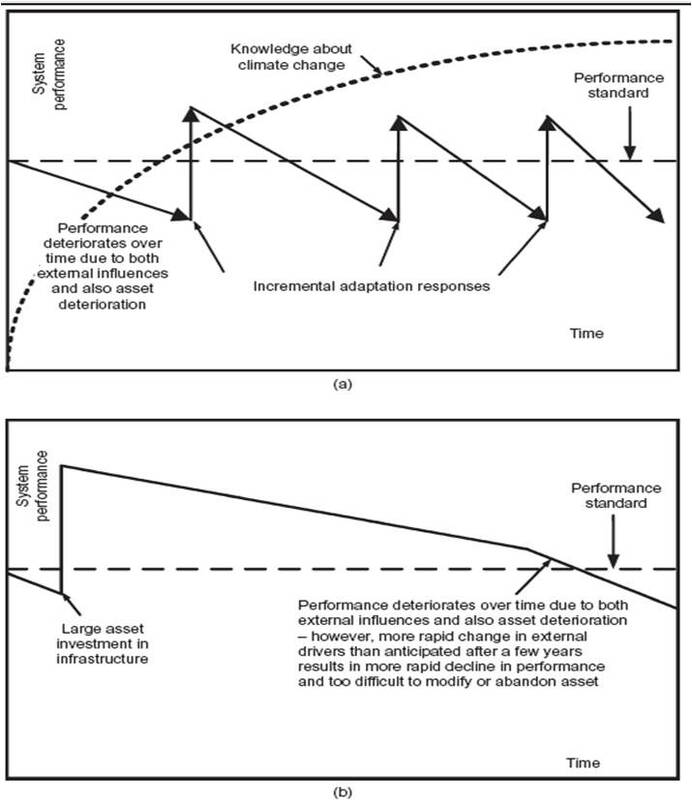 They say that traditional approaches are based on the assumption “that it is possible to define a singular optimum adaptation strategy according to the ‘most likely’ or average future projection” (p.15). Big investments of public dollars are common with the traditional approach – essentially a large bet on the promise of a singular optimum strategy (one-off interventions). The paper’s authors argue for an adaptively resilient approach instead, an approach better suited to the uncertainties of climate change. Rather than taking a traditional approach, responsible climate adaptation requires an alternative approach that attempts to assess and manage the resiliency of the flooding system for long-term future change. The aim of this approach is to keep the system within a configuration of states that give at least acceptable functioning despite the occurrence of possible changes (Walker et al. 2002**). This means that the approach acknowledges that projections are ‘always wrong’ and that it is necessary to plan for a range of possible future conditions. The authors’ modeling results suggest that adaptation decisions that include LEARNING about future climate parameters could reduce overall costs between 5 and 17% over a single high risk traditional, or “robust,” intervention. The figure below illustrates the concept. *Gersonius et al. 2010. Managing the flooding system’s resiliency to climate change. Proceedings of the Institution of Civil Engineers ES1: 15-22. ** Walker et al. 2002. Resilience management in social-ecological systems: A working hypothesis for a participatory approach. Conservation Ecology 6:14. 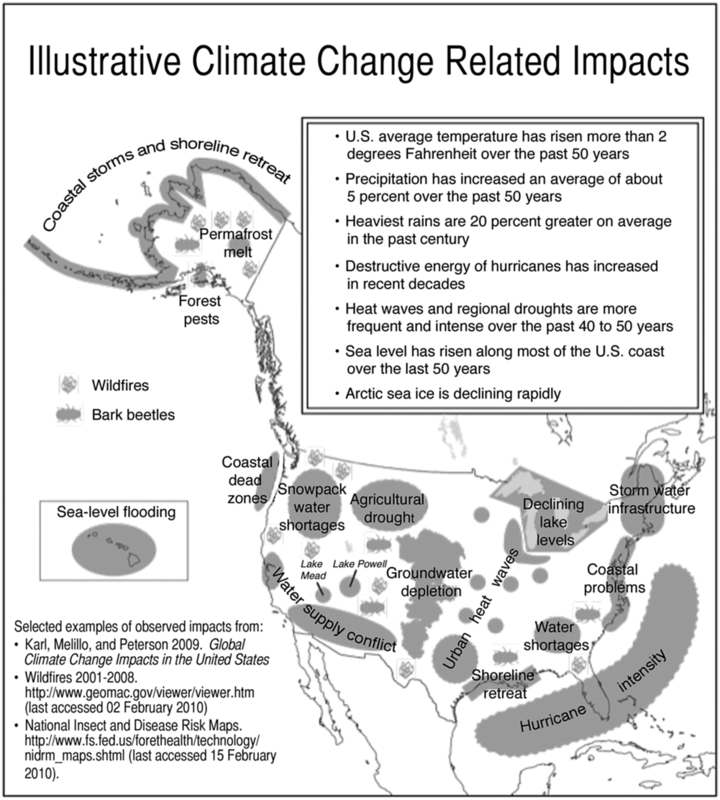 A good graphic synopsis of climate change effects in the U.S. is found in an article by Wilbanks and Kates (2010) in the Annals of the Association of American Geographers (Vol. 100, No. 4: 719-728). The figure depicts the main impacts, but details are lost at this scale. What does the future hold for your neck of the woods?